"She opened doors that were not only closed, I didn't even know they were doors"
Disability Studies is not anything new to the George Washington University, nor especially to its English Literature Department. The history of events such as the Composing Disability Conference, special guest speakers, and publications testify that GWU has been a home for Disability scholarship and activism to grow. Indeed, the host of parties ready to jump on board projects to Crip the University make evident the network that has already developed, e.g. the GW Creative Writing Program, Disability Support Services, Women's Studies, Philosophy, The University Writing Program, the Digital Humanities Institute, the Vice Provost's Office for Diversity and Inclusion, and Africana Studies. 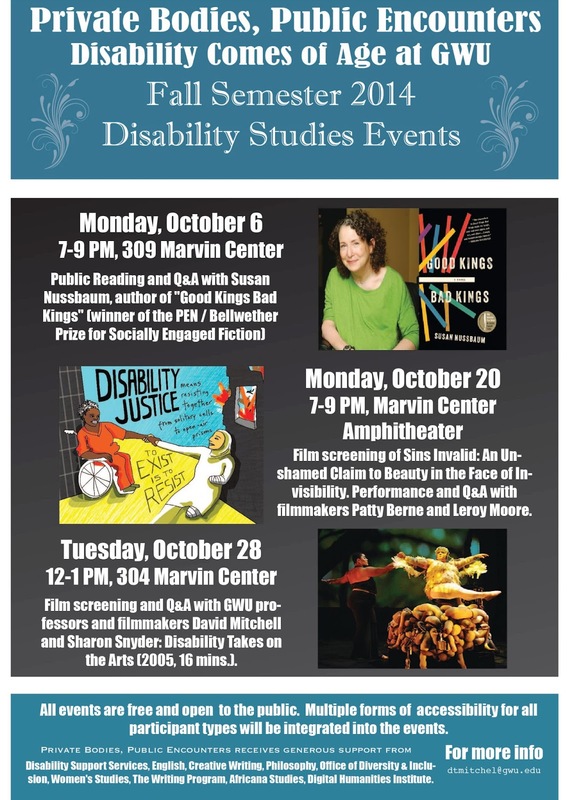 With the Private Bodies, Public Encounters series of guest talks, movie screenings, and book readings throughout October (Disability History month), the University is signaling that "Disability has Come of Age at GWU." Pushed forward by a bulwark of faculty, the congress of departments and institutions are staking a claim for the future of disability studies in Washington DC. Following a socially engaged tactic central to crip activism, the coalition brought in speakers from near and far to skillfully deploy "Private Bodies" to shift the focus from individual persons or organizations to "Public Encounters." Each event stressed the ecology of embodied experience that connects rather than forecloses the lives of disabled bodies and intersecting contexts such as race, gender, and class. 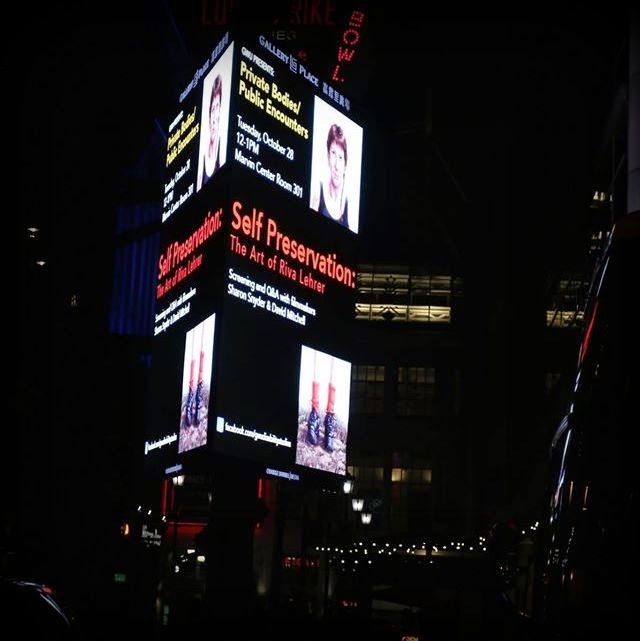 Reclaiming access to bodies and shared experiences was a focal topic for discussion in the first event in Private Bodies, Public Encounters, with Susan Nussbaum's public reading of Good Kings, Bad Kings on October 6th, 2014. The over 60 persons in attendance on this first night were drawn in by various university seminars, posters, and a several story tall electronic billboard over Gallery Place. Once in the room, sign-language interpreters, micro-phone runners, and an interviewer helped facilitate the conversation between Nussbaum and a wide variety of guests. Indeed, for those who could not physically be in attendance, the event was video recorded as well as published via livetweeting. Excitement generated on the first night spilled over into the screening and discussion of Sins Invalid with Leroy Moore Jr. Working through technological challenges and problems of accessibility, the film brought audience members into the theater studios where an array of performers shared their lives and experiences of disability. Stories ranged from an intimate look into private bodies and sexual encounters to a dramatic dance ending in a flying wheelchair in front of a blood-red cross representing the passion and violence of public encounters. The film used sights, sounds, and bodily contact to give viewers entrance points into lives that are often segregated or covered up. Framing the screening, Moore Jr. discussed how the project of creating bridges required ideological as well as technical crossings. 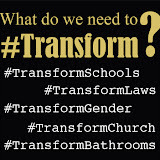 One goes from "Disability Rights" (the architectural and legal work towards equality and access) to "Disability Justice" (the cultural work towards diversifying presentation and community) by "coming face to face with your 'isms" argued Moore Jr (@Transliterature). This endeavor in intersectionality helped to generate collective projects such as Sins Invalid on stage and on screen, as well as Moore Jr.'s personal project Kriphop, the embodied performance of hip-hop and disability that changes one's experience to both (@Transliterature). Sharing some of his verse with the audience, Moore Jr. concluded by talking about the critical work of re-presentation that artistic ventures such as these accomplish offering alternative scripts for race, gender and disabled sexuality. Closing out the month, professors and filmmakers Sharon Snyder and David Mitchell screened "Self Preservation: The Art of Riva Lehrer" and discussed the crip politics of aesthetics. Working in conjunction with the George Washington University Textile Museum, Snyder and Mitchell opened the event by showcasing a lab-coat constructed by Carrie Sandahl to draw critical attention to the medical industry's invasive surveillance and management of persons with disabilities. Demonstrating the inextricability of the lives of objects and bodies, the textile materialized the film's argument on Lehrer's work: liminal disabled lives can find preservation through art. The film brought together interviews with Riva Lehrer and several of her subjects, friends, and fellow activists to unpack the politics of persistence in her work. While portraits are often said to tell a story across the space of the canvas, the film read back into the paintings how the temporal experience of producing the works affect the lives of those connected with the subjects and topics portrayed. "We can be heroes forever and ever, we can be heroes just for one day," cooed David Bowie as the film's soundtrack underlined the liminality of disabled lives. Like Nussbaum's writing and Moore Jr.'s performance, Riva Lehrer's paintings transform private bodies into matters of public encounter that carry the demand social change beyond the physical and ideological barriers that restrict the personal lives they connect. As Snyder and Mitchell's film and discussion afterwards argued, however, this work does not only move in one direction. The preservation of art can also have direct impact on the lives that produce it, giving the emotional, financial, and social support that sustain persons marked by disability and affirm them as lives worth living.